Paediatric low-grade gliomas (LGGs) encompass a heterogeneous set of tumours of different histologies, site of lesion, age and gender distribution, growth potential, morphological features, tendency to progression and clinical course. Among LGGs, Pilocytic astrocytomas (PAs) are the most common central nervous system (CNS) tumours in children. They are typically well-circumscribed, classified as grade I by the World Health Organization (WHO), but recurrence or progressive disease occurs in about 10-20% of cases. Despite radiological and neuropathological features deemed as classic are acknowledged, PA may present a bewildering variety of microscopic features. Indeed, tumours containing both neoplastic ganglion and astrocytic cells occur at a lower frequency. Gene expression profiling on 40 primary LGGs including PAs and mixed glial-neuronal tumours comprising gangliogliomas (GG) and desmoplastic infantile gangliogliomas (DIG) using Affymetrix array platform was performed. A biologically validated machine learning workflow for the identification of microarray-based gene signatures was devised. The method is based on a sparsity inducing regularization algorithm l 1 l 2 that selects relevant variables and takes into account their correlation. The most significant genetic signatures emerging from gene-chip analysis were confirmed and validated by qPCR. We identified an expression signature composed by a biologically validated list of 15 genes, able to distinguish infratentorial from supratentorial LGGs. In addition, a specific molecular fingerprinting distinguishes the supratentorial PAs from those originating in the posterior fossa. Lastly, within supratentorial tumours, we also identified a gene expression pattern composed by neurogenesis, cell motility and cell growth genes which dichotomize mixed glial-neuronal tumours versus PAs. Our results reinforce previous observations about aberrant activation of the mitogen-activated protein kinase (MAPK) pathway in LGGs, but still point to an active involvement of TGF-beta signaling pathway in the PA development and pick out some hitherto unreported genes worthy of further investigation for the mixed glial-neuronal tumours. The identification of a brain region-specific gene signature suggests that LGGs, with similar pathological features but located at different sites, may be distinguishable on the basis of cancer genetics. Molecular fingerprinting seems to be able to better sub-classify such morphologically heterogeneous tumours and it is remarkable that mixed glial-neuronal tumours are strikingly separated from PAs. Primary intra-axial paediatric low grade tumours include pilocytic astrocytoma (PA), pilomyxoid astrocytoma, diffuse fibrillary astrocytoma (FA), ganglioglioma (GG), desmoplastic infantile ganglioglioma (DIG), desmoplastic infantile astrocytoma (DIA) and dysembryoplastic neuroepithelial tumour . For brevity, they will be thereafter defined LGG. PA is the most common central nervous system (CNS) tumour, representing approximately 21-23% of all primary brain tumours in children . It is typically a well-circumscribed, contrast-enhancing astrocytic neoplasm with prolonged overall survival and high complete remission rates . PA arises most commonly in the cerebellum, but can be found anywhere, including the cerebral hemispheres, thalamus and hypothalamus, brainstem, optic pathways, and spinal cord [3, 4]. Reflecting the generally slow growth and low proliferative potential of LGGs, complete surgical resection is the preferred therapeutic choice. Unfortunately, gross total resection is not attainable in many of these tumours that are centrally located which, in about 10 to 20% of the cases, despite adjuvant treatment, tend to recur or show progressive growth [5, 6]. Most importantly, rare examples of PA undergo malignant transformation, even if completely resected [7, 8]. Despite radiological and neuropathological features deemed as classic are acknowledged, PA may present a bewildering variety of microscopic features, including a wide range of tissue patterns, most of which may be found within the same lesion. It is worth remembering that both normal and neoplastic astrocytes exhibit molecular and functional heterogeneity [9–13]. The tumours containing both neoplastic ganglion and astrocytic cells are rare, representing less than an hundredth of the tumours of CNS and its coverings. Such tumours, which belong to the neuronal and mixed glial-neuronal tumours of the WHO classification and corresponding to grade I, comprise gangliogliomas (GG), and gangliogliomas with desmoplasia, i.e. desmoplastic infantile gangliogliomas (DIG) both typically arising from the telencephalon . The differential diagnosis may be difficult due to small biopsy size. Moreover, the glial component of a ganglioglioma may be pilocytic looking (this is as much as to say that a pilocytic morphology is considered completely acceptable in a ganglioglioma). Lack of specific immunohistochemical, cytogenetic, or molecular markers increases difficulties in classification. The expanding utilization of high-throughput technologies to study paediatric brain tumours will likely change how they are both classified and treated henceforward [5, 6]. In this field, the use of microarrays has been expanding exponentially to several areas such as genetic screening, safety assessment and diagnostics , but repeatability of published microarray studies is apparently limited [15, 16]. In the neuro-oncological context, a LGG genotype-phenotype correlation still remains an open problem [17, 18]. Gene signatures able to classify LGGs in accordance with clinical and biological features were provided [9, 19–22]. Nevertheless, a complete genetic landscape of paediatric PA is still missing and the specific molecular signatures able to correlate their phenotype (brain sites and heterogeneous histotypes) to their genotype still remain to be studied in depth. Keeping this in mind, we aimed to identify a molecular fingerprinting able to reflect different histotypes and brain region in LGGs. In particular, the study addressed three different biological questions: (1) characterize supratentorial vs. infratentorial LGGs, (2) identify a specific characterization for the PAs based upon site of lesion, and (3) discriminate, within supratentorial neoplasms, mixed glial-neuronal tumours vs. PAs. This relatively simple, albeit fraught with meaning, goal gave us the opportunity to develop a robust and validated experimental workflow, paving the way for future studies, whose goal will be the identification of gene fingerprints explicitly correlated to clinical parameters. We adopted a biologically validated method to identify reliable and predictive gene expression signatures on tumour data. The pipeline, represented in Figure 1, is a supervised machine learning workflow consisting in 3 main consecutive phases: case selection and tumour specimen processing, unbiased l 1 l 2 feature selection framework with functional characterization of the gene signature, and real-time quantitative reverse transcription-PCR (qPCR). Detailed description of the pipeline is reported in Additional file 1. Workflow. This figure depicts the entire workflow consisting in several computational and biological procedures. 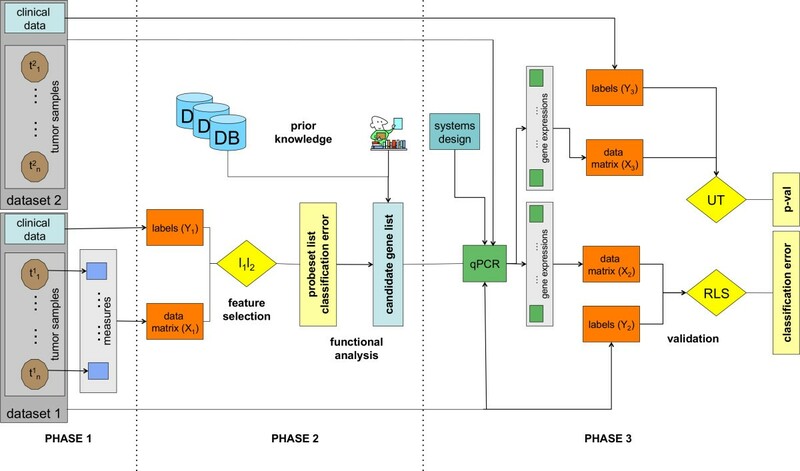 The three main phases are indicated as Phase 1 (data preparation), Phase 2 (statistical analysis and candidate gene list identification) and Phase 3 (validation). A series (dataset 1) of 40 paediatric primary LGGs who underwent surgery from 1991 to 2009 at the Neurosurgery Unit of the Giannina Gaslini Children’s Hospital were selected and enrolled in the study. The inclusion criteria were diagnosis of PA or ganglioglioma with or without desmoplasia, i.e. GG or DIG; the availability of complete clinical data and fresh frozen tissue specimen with a tumour cell content of at least 80%, while exclusion criteria were lack of histological diagnosis and the presence of extensive dissemination. The cohort included 27 PAs, 12 mixed glial-neuronal tumours (7 GGs and 5 DIGs) and one FA. Seventeen tumours arose in infratentorial regions, while 23 were supratentorial. The FA was forced in the first phase of analysis and partially during the second phase in order to have an internal control. Only one case was associated with a genetic syndrome, namely Neurofibromatosis type 1 (NF1) [MIM ID #162200]. The male/female ratio of 1.2:1, and the mean age 7 years (range 5 months to 17 years). The main clinical-pathological features are summarized in Table 1. The sections were reviewed by the local neuropathologist (P.N.) and the tumours were classified according to the WHO classification . The sets of samples are formed to precisely answer the biological questions of interest. Moreover, the sets were made the more homogeneous possible in order to minimize the undesiderable effects of the inter-tumoural genetic differences due to the intrinsic constitutional variations among individuals. For each patient we report the corresponding ID, age at surgery (in months), gender (F = female, M= male), diagnosis (PA = pilocytic astrocytoma, FA = diffuse fibrillary astrocytoma, DIG = desmoplastic infantile ganglioglioma, GG = ganglioglioma and site of lesion. Patient ID24 reported in bold is associated to the genetic syndrome NF1. Total RNA was extracted from serial frozen sections of tumour tissue by using the TRIzol reagent combined with silica column purification system (Invitrogen, Carlsbad, CA). Quantification and quality assurance were performed using the NanoDrop spectrophotometer (NanoDrop Technologies Wilmington, Delawere USA) and the Agilent 2100 bioanalyzer (Agilent Technologies, Waldbronn, Germany), respectively. Double-stranded cDNA were processed according to the Affymetrix GeneChip Expression Analysis Technical Manual (Affymetrix, Santa Clara, CA). Microarray data for 40 LGG samples was generated with Affymetrix HG-U133Plus2.0 arrays (Affymetrix, Santa Clara, CA). Gene expressions were extracted from the .CEL files and normalized using the Robust Multichip Average method  by running an R  script, based on the aroma package . The dataset for the microarray experiment was uploaded in the Gene Expression Omnibus public repository at National Center for Biotechnology Information [accession number GSE28238]. Written informed consent was obtained from all the patients’parents or guardians and the local Ethics Committee for human studies approved the research. The feature selection method we adopted is a regularization method capable of selecting subsets of discriminative genes, namely l1l2 regularization with double optimization. The algorithm can be tuned to give a minimal set of discriminative genes or larger sets including correlated genes. The method is based on the optimization principle presented in  and further developed and studied in [27, 28]. The l1l2 with double optimization algorithm looks for a linear function (model), whose sign gives the classification rule that can be used to associate a new sample to one of the two classes. The output function is a sparse model, i.e. some input variables (probe-sets) will not contribute to the final estimator. The algorithm is based on the minimization of a functional depending on a least square error term combined with two penalties. The least square term ensures fitting of the data whereas adding the two penalties allows to avoid over-fitting. The role of the two penalties is different, the l1 term (sum of absolute values) enforces the solution to be sparse, the l2 term (sum of the squares) preserves correlation among the variables. The training for selection and classification requires the choice of the regularization parameters for both l1l2 regularization and regularized least squares (RLS) denoted with τ* and λ*, respectively. In fact model selection and statistical significance is performed within two nested K-cross validation loops as in [29, 30]. Being interested in a comprehensive list of relevant variables we fixed our attention on the lists obtained with the highest values for the correlation parameter μ. The statistical framework described above provides a set of K lists of selected variables, therefore it is necessary to choose an appropriate criterion  in order to assess a common list of relevant variables (probe-sets or proteins, in our case). We based ours on the absolute frequency, i.e. we decided to promote as relevant variables the most stable probe-sets across the lists. The threshold we used to select the final lists was chosen according to the slope variation of the number of selected genes vs. frequency (plot not shown), its value being 70%. In this way we manage to cut out those variables that are not stable across the cross-validation lists, similarly to the procedure adopted in . We also visualized the signatures in heat-map plots and 3d visualizations of classified samples. Multiple probe-sets for a gene were collapsed to one entry per gene, based on the best frequency score. Non-mapping or non-coding probe-sets were discarded. The National Institute of Health Database for Annotation, Visualization and Integrated Discovery (DAVID) web-tool  was used to identify structural, functional, and pathway categories in the selected list. The analysis also ranked in detail the Gene Ontology (GO)  terms in the Biological Process (BP) domain including the identified probe-sets. The functional annotation was performed using the Expression Analysis Systematic Explorer (EASE)  with structural and functional class data from the GO, GenBank and UniGene databases, and with pathway data from Gene Map Annotator and Pathway Profiler (GenMAPP) , the Kyoto Encyclopedia of Genes and Genomes (KEGG)  and the Biocarta  databases. The Exploratory Gene Association Networks (EGAN) Java desktop application was also used to visualize the interactions among the selected genes . Following the same criteria for the case selection, we chose an additional set of patients (dataset 2), composed by 14 PAs and 4 mixed glial-neuronal tumours, in order to confirm and validate with qPCR the most significant genetic signatures emerging from gene-chip analysis. Each systems were in-house designed by a fine tuning procedure as described . Specific primers were developed targeting: ABBA1 [NM 138383], APOD [NM 001647], ARX [NM 139058], CXCL14 [NM 004887], FOSB [NM 001114171], FOXG1 [NM 005249], GPR17 [NM 001161415], LHX2 [NM 004789], NRXN2 [NM 015080], PTGD2S [NM 000954], SDC3 [NM 014654], SNX22 [NM 024798], SPOCK1 [NM 004598], TIMP4 [NM 003256] and ZFHX4 [NM 024721]. Primers sequences and the amplification conditions are reported in Additional file 2. Beta actin (ACTB) [NM 001101], Pyruvate kinase (PKM2) [NM 002654] and Beta-2-microglobulin (B2M) [NM 004048] were used as the endogenous control genes for each tumour specimen . Amplifications were performed using an ABI PRISM 7500 HT Sequence Detection System (Applied Biosystems, Foster City, CA) and primer concentrations were adjusted accordingly to the assays temperature. Validation of each system was performed using standard curves (SCs) on cDNA derived from the 1603-MED medulloblastoma cell line . The reproducibility of the calibration curve was analyzed qPCR efficiencies of each system were calculated as described . The relative quantification of genes transcript was performed according to the comparative method (2-ΔCt), Applied Biosystems User Bulletin no. 2P/N 4303859) [42, 43], using the value emerged by geometric mean of B2M, PKM2 and ACTB as the normalizer (Ct ref ). Gene expression levels of the 18 candidates were calculated for each LGG sample by the 2-ΔΔCt equation using as ΔCt ref the median ΔCt value among all cases. The Minimum Information for Publication of qPCR Experiments (MIQE) are provided . Comparisons of the quantitative data of gene expressions were performed by the Mann–Whitney U test since the normality and homoscedasticity assumptions were not fulfilled. Statistical tests were 2-sided, and a p-value less than 0.05 was considered statistically significant. We also performed a multivariate data analysis by employing the algorithm known as Regularized Least Squares (RLS) . The algorithm is based on the minimization of a functional depending on a least square error term combined with a regularization term, i.e., the l2 term (sum of the squares). Similarly to the l1l2 algorithm, RLS is run in a double nested cross-validation framework to avoid selection bias. We conducted a high-resolution analysis of genome-wide expression patterns on 40 paediatric LGGs, including 17 arising in infratentorial and 23 in supratentorial regions (Table 1), using Affymetrix HG-U133 Plus 2.0 chip-arrays. To select a list of highly discriminative probe-sets, we applied the l1l2 selection statistical framework to the dataset. The system performance was evaluated by its corresponding cross-validation error, as low as 8%. The resulting list, reported in Additional file 3, consists of 331 probe-sets, sorted according to their frequency score and corresponding to the maximum value of the correlation parameter μ. The strong discriminative power of the selected probe-sets is depicted by either a heat-map plot or a multivariate representation (Figure 2a,b). The FA case was not classified neither supratentorial nor infratentorial by the l1l2 algorithm, showing the robustness of the method. Infratentorial vs. Supratentorial LGGs. a) Heatmap - infratentorial vs. supratentorial LGGs. Heatmap plot of the gene expression submatrix of the 40 samples restricted to the 331 probe-sets selected by the l1l2 feature selection. The tumours are grouped according to the lesion site (infratentorial vs. supratentorial). Each column represents a sample and each row is associated to a probe-set. The relative expression of the probe-sets is normalized ranging from 0 (blue, under-represented) to 1 (red, over-expressed); b). This figure illustrates a 3-dimensional visualization of the dataset restricted to the 331 selected probe-sets. The 3D representation is obtained by projecting the data submatrix onto its 3 principal components i.e. the components of maximum variance. Red circles represent the supratentorial and the blue circles the infratentorial LGGs; c). EGAN sotware provide a hypergraph visualization showing how enriched gene sets/pathways/GO connect significant genes from LGGs signature along with standard protein-protein interaction. In order to obtain a 3D visualization, the expression data restricted to the 331 probe-sets was projected on its first 3 principal components, i.e., the components of maximum variance. It is evident that the two classes are clearly separated in the multidimensional space (Figure 2b). In Table 2 we list the selected genes and the highest frequency score associated to each of them. List of 206 gene symbols selected by the l1l2 procedure. For each Gene ID we report the highest frequency score. We share 14 genes, showed in bold, with the results reported by previous studies [9, 19, 20]. Over-representation analysis using DAVID web-tool revealed that the main GO terms in the biological process (BP) domain include: neuronal development, brain morphogenesis and anatomical structure development. Thanks to the EGAN software program, that interfaces with existing GO and literature annotation of the genes and with canonical pathways to perform enrichment statistics, molecular networks based on direct or indirect gene-gene interactions were created for the list of 206 genes we identified. The most enriched pathways are chemokine signaling, mitogen-activated protein kinase (MAPK) signaling, T cell receptor signaling and cell adhesion molecules (CAMs) pathways (Figure 2c). Using the available WEB-based gene set analysis tools, a functionally based criterion was then applied to the list of 206 genes in order to select groups of genes that were most represented in the tumour development pathways and that were top-ranked in the l1l2 list. The resultant minimal list was composed by 19 out of 331 probe-sets, corresponding to 15 loci, see Table 3. Relative functional analysis showed that the selected genes enriched BP related to CNS neuron differentiation, forebrain development, regulation of metabolic process, and cell proliferation. A brief comment of each locus is reported in Additional file 4, listing the main protein functions for the 15 genes that significantly discriminate infratentorial versus supratentorial LGGs. Gene annotations and GO Biological Process terms for the minimal list of 15 genes, selected for the biologically validated molecular fingerprint of LGGs related to site of lesion (infratentorial vs supratentorial). In order to confirm and validate the results of microarray analyses, we considered 52 samples measured with qPCR, whose 34 samples from dataset 1 subjected to microarray experiments and 18 samples from dataset 2, on which only qPCR was performed (see Figure 1). The relative quantification of the gene expression level for each gene was performed according to the comparative method 2-ΔΔCt, using the averaged ΔCt value on all the LGG samples as tissue control (ΔCt ref ). All 15 loci (represented by 19 probe-sets) were confirmed and validated (Table 4). The qPCR confirmed that all the 15 genes were differentially expressed between infratentorial versus supratentorial LGGs in multivariate analysis (RLS) (Table 4). Indeed, the Mann–Whitney test identified 5 out of 15 genes which were also significant in univariate analysis (Table 4). They were: aristaless related homeobox (ARX), chemokine (C-X-C motif) ligand 14 (CXCL14), G protein-coupled receptor 17 (GPR17), LIM homeobox 2 (LHX2) and prostaglandin D2 synthase (PTGD2S), whose expressions resulted down-regulated in infratentorial tumours and up-regulated in supratentorial ones. For each sample we measured the qPCR expressions of the 5 selected genes and we verified that the expressions were up- and down- regulated according to the lesion site (Figure 3a). qPCR values for dataset 1 (34 samples) and 2 (18 samples). Gene expressions were significantly different for all listed genes by multivariate analysis (RLS). The genes in bold are those passing the Mann–Whitney test (only its significant p-values are reported on the right column). S: Supratentorial, I: Infratentorial. The best differentially expressed genes with qPCR between infratentorial and supratentorial LGGs. a) the best differentially expressed genes with qPCR between infratentorial and supratentorial LGGs. Relative gene expression for the best 5 differentially expressed genes selected with univariate Mann–Whitney test; b) in this plot we show the comparison between the microarray and the values of the estimated RLS classification function for each sample measured by both qPCR and microarray. The negative values are assigned to the infratentorial site, while positives are the supratentorial ones. The blue circles correspond to the correctly classified cases by qPCR. The red circles indicate the misclassified samples by qPCR. The green dots are the misclassified samples by the microarray model. Next, to build a multivariate statistical model on the qPCR data and validate the results of the microarray analyses we applied RLS classification method. The LOO-cross-validation error was 25%. The multivariate model obtained with the RLS analysis was used to classify the available samples, achieving an accuracy of 91%. The classification results were compared to those achieved by the multivariate model from the l1l2 analysis on the microarray data (Figure 3b). Needless to say, we could only compare the results on the samples in dataset 1 measured both with microarray and qPCR (n = 34). 29 out of 34 (85%) were correctly classified by both methods. The microarray and qPCR analyses could not correctly classify 3 cases, two of which were assigned to the right class by the qPCR model. One sample was incorrectly classified by both approaches hence 33 out of 34 were associated to the right class by either method. Similarly, we conducted the analysis only on 27 PAs out of 40 LGGs (the FA was excluded), whose 17 arising in infratentorial and 10 in supratentorial regions, see Table 1. Thank to the application of the l1l2 selection framework to the dataset, a list of 136 highly discriminative probe-sets corresponding to 82 genes was selected (see Additional file 5). The system performance was evaluated by its corresponding cross-validation error, as low as 15.4%. The strong discriminative power of the 136 selected probe-sets is visualized in Figure 4a,b. As shown in Figure 4b, the two classes of PA related to site of lesion are clearly separated in the multidimensional space. Again, the functional characterization of the gene signature performed with different web-tools, shows distinct processes enriched, as following: nervous system development, cell morphogenesis and cell adhesion, MAPK cascade, and chemotaxis. Moreover, the main pathways coming out are: chemokine signaling, transforming growth factor beta (TGF-β) signaling, MAPK signaling, Glioma, and WNT signaling pathways. The gene signature of this question is almost completely included in the larger LGG gene signature (62 common genes), but nineteen genes were specifically related to PA histotype as a group (see genes reported in bold in Additional file 5). Intriguingly, gene ontology analysis showed that distinct genes among the 19 related to PA, create a network within the TGF-β signaling pathway [KEGG ID: 04350]. Molecular fingerprinting sub-classify infratentorial from supratentorial PAs as well as separate mixed glial-neuronal tumours from PAs. a) heatmap - infratentorial vs. supratentorial PAs. Heatmap plot of the gene expression submatrix of the 27 PAs restricted to the 136 probesets selected by the l1l2 feature selection. The tumours are grouped according to the lesion site (infratentorial vs. supratentorial). Each column represents a sample and each row is associated to a probe-set. The relative expression of the probe-sets is normalized ranging from 0 (blue, under-represented) to 1 (red, over-expressed), b) This figure illustrates a 3-dimensional visualization of the dataset restricted to the 136 selected probe-sets. The 3D representation is obtained by projecting the data submatrix onto its 3 principal components i.e. the components of maximum variance. Red circles represent the supratentorial and the blue circles the infratentorial PAs; c) This figure illustrates a 3D projection of the dataset restricted to the 103 selected probe-sets for the supratentorial tumours: mixed glial-neuronal tumours vs. PAs. The 3D representation is obtained by projecting the data submatrix onto its 3 principal components i.e. the components of maximum variance. 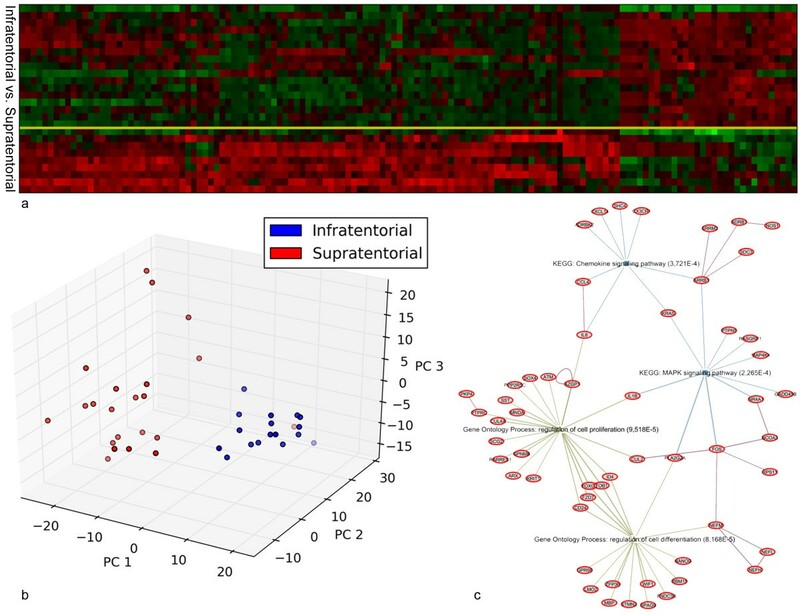 Red circles represent the PAs and the blue circles the mixed glial-neuronal tumours; d) Heatmap plot of the gene expression submatrix of the 22 supratentorial tumours restricted to the 103 probe-sets selected by the l1l2 feature selection. The tumours are grouped according to the histotype (mixed glial-neuronal tumours vs. PAs) Each column represents a sample and each row is associated to a probe-set. The relative expression of the probe-sets is normalized ranging from 0 (blue, under-represented) to 1 (red, over-expressed). Finally, the same analysis pipeline was applied to 22 supratentorial LGGs to distinguish mixed glial-neuronal tumours (12 samples) from PAs (10 samples), see Table 1. The l1l2 algorithm selected a list of 103 highly discriminative probe-sets corresponding to 70 genes as shown in Additional file 6. Even in this case, the system performance with its corresponding cross-validation error, i.e., 27% was analyzed. The list of 70 genes, able to discriminate mixed glial-neuronal tumours vs. PAs (Figure 4c,d), includes genes involved in the extracellular matrix organization, forebrain development, and neuron differentiation such as distal-less homeobox 1 and 2 (DLX1, DLX2), immune response, such as hemoglobin alpha 1 and 2 (HBA1/2), chemokine (C-X-C motif) ligand 12 (CXCL12), chemokine (C-C motif) ligand 5 (CCL5), and metabolic proteins (Additional file 4). Distinct pathways are enriched: toll-like receptor signaling, focal adhesion, extracellular matrix constituents and remodeling machinery, and extracellular matrix (ECM) receptor interaction pathways. Interestingly, the presence of gene family of collagen such as collagen type I, alpha 1 and 2 (COL1A1, COL1A2), collagen type III, alpha1 (COL3A1), collagen type V, alpha 1 (COL5A1), and collagen type VI, alpha 2 and 3 (COL6A2, COL6A3) are significantly represented in mixed glial-neuronal tumours. A major emphasis has historically been placed on stratifying LGGs diagnosis or therapy on the basis of pathological and molecular genetic criteria. However, the increasing application of molecular approaches is transforming the way to categorize these tumours, since it seems that histologically comparable lesions may exhibit diverse patterns of gene expression and genomic alterations [5–7, 9, 19, 20]. This investigation has focused on the identification of a specific gene signature based on high-throughput techniques that provide a genome-wide snapshot of LGGs with respect to both distinct lesion site in the brain and histotype. Although an abundance of data is available on gene expression profiles of LGGs, they are often conflicting. Indeed, statistical methods for evaluation and interpretation of microarray data are still evolving. We successfully adopted an analysis workflow (Figure 1) able to overcome a major criticality in high-throughput studies, that is to find robust, reproducible and biologically sound results [16, 46]. Details of the workflow description are reported in Additional file 1. Question (1) was used to assess the procedure and represent the first example of biologically validated l1l2 framework with an independent methodology. Indeed, this query is the one with more samples available as well as the one already investigated in previous works [9, 19]. The provided outcome from l1l2 was a list of 331 probe sets (Additional file 3), corresponding to 206 loci, above 70% of frequency. l1l2 produces a multi-gene model and only a multidimensional representation can correctly visualize its strong discriminative power (Figure 2b). The figure shows that the infratentorial tumours group is spatially separated from the supratentorial counterpart. Our analysis identified various interesting genes which encode cell adhesion molecules, ECM, extracellular matrix, lipid metabolism, CNS development, cell differentiation, transcription regulation, and invasion-related proteins. Unlike Potter et al. reported , our results are in line with previous findings that clearly defined the existence of PA subgroups. Indeed, 14 out of 206 differentially expressed genes (reported in bold in Table 2) were reported by previous studies [9, 19, 20]. Wong and colleagues identified two subgroups of PA reporting a list of significant differentially expressed genes involved in cell adhesion, regulation of cell growth, cell motility, and angiogenesis . Sharma and colleagues reported differential expression of genes playing a role in forebrain development as LHX2 and nuclear receptor subfamily 2, group E, member 1 (NR2E1), and hindbrain development as paired box gene 3 (PAX3) and iroquois homeobox protein 2 (IRX2), able to stratify infratentorial from supratentorial PAs . The comparison with the Sharma’s data, the only comparable, inasmuch as homologous for case selection, sample processing and Affymetrix platform, allowed us, even using our own statistical approach, to identify five genes (LHX2, NR2E1, PAX3, IRX2, and zinc finger homeobox 4, (ZFHX4) common to both analyses. To investigate paediatric LGG development related to site of lesion (infratentorial vs. supratentorial) , we next proceeded by selecting those candidate genes that were most represented among all the high-ranked pathways for the validation process by using our in-house designed qPCR systems on 52 samples (34 samples belonged to dataset 1, while 18 samples were from dataset 2). Finally, the list of candidates comprised 19 probe-sets corresponding to 15 loci in total (Table 3). We validated the generalization ability of the 15 gene signature by applying a multivariate statistical model on the qPCR data of dataset 1 (34 samples). Such multivariate model, obtained with a RLS analysis, was used to assign the samples to a group and the classification results were compared to the l1l2 microarray-based model (Figure 3b). The two independent methods have good performances, being able to associate 33 out of 34 samples to the right class. Moreover, 5 out of 15 genes emerged from the univariate Mann–Whitney test on the qPCR data, confirming and enhancing the LGG differences in infratentorial as compared with supratentorial regions, see Table 4 and Figure 3a. As shown in Figure 3a, a group of 4 genes (ARX, GPR17, LHX2 and CXCL14) well stratified LGGs between infratentorial and supratentorial tumours. ARX is a homeobox-containing gene expressed during development. This gene is involved in CNS development and in cell proliferation in forebrain [GO:0021846]. Mutations in this gene cause X-linked mental retardation and epilepsy. To the best of our knowledge, ARX was never associated with LGGs. GPR17 is a G-protein involved in signal transduction [GO:0007165]. LHX2 is downregulated in infratentorial tumours as already reported . CXCL14 is a chemokine associated with tumour development [GO:0006995], and PTDG2S whose functions are associated to lipid metabolism [GO:0006633], might be involved in controlling the proliferation rate of LGGs. Additionally, the predominant terms related to pathways consisted of MAPK signaling pathway, containing at least 12 genes, followed by chemokine signaling pathway with 8 genes enriched. These findings reinforce the observations of several consecutive articles about aberrant activation of the mitogen-activated protein kinase (MAPK) pathway in LGGs . The identification of a brain region-specific gene signature suggests that LGGs at different sites may be distinct in terms of biological properties and tumorigenesis despite the same histology. KIAA1549:BRAF fusions were analyzed in the LGG cohort and we found the gene fusion slightly more frequent in infratentorial (38.5%) versus supratentorial (25%) tumours, while we didn’t note any difference for BRAF V600E mutation. Moreover, we did not identify significantly improved progression-free survival in tumours with gene-fusions or BRAF V600E mutation. Next, to molecularly characterize PA able to distinguish infratentorial versus supratentorial, l1l2 analysis were conducted only on 27 PAs out of 37 LGGs, whose 17 arising in infratentorial and 10 in supratentorial regions, see Table 1. A gene signature of 82 genes (see Additional file 5) well distinguishes PA arising supratentorial versus infratentorial regions (Figures 4a,b). Significant biological processes represented include GO terms of nervous system development, cell morphogenesis, cell differentiation and cell adhesion, MAPKKK cascade, chemotaxis, and regulation of neurogenesis. We found that, together with ARX, forkhead box G1 (FOXG1) was strongly represented in PA. FOXG1 is an oncogenic transformer which could play an important role in controlling both cell proliferation and forebrain cell differentiation in PA [21, 49–51]. Through the comparison of gene lists between LGG and PA, we found 19 genes specifically related with PA histotype as a group (genes in bold in Additional file 5). The functional analysis showed that several genes create a network within the (TGF-β)-signaling pathway. This pathway possess a dual role in oncogenesis. In some tumour types, i.e., in high-grade gliomas, TGF-beta becomes an oncogenic factor, while it is also considered a tumour suppressor factor in normal epithelial cells and astrocytes. Moreover, noncanonical TGF-beta signaling pathways interact, through RSmads molecules, with MAPK signaling pathway . Thanks to this interaction, it is likely to assume an active involvement of TGF-beta signaling pathway in the PA development. Our analysis shows a strong difference between supratentorial and infratentorial PAs. In fact, cerebellar PAs, corresponding to the classical description of the biphasic tumour with compact areas with piloid cells and Rosenthal fibers and microcistic areas with granular eosinophilic bodies , seem to be defined by a specific gene signature versus supratentorial PAs. Therefore, this molecular fingerprint is able to better sub-classify such a morphologically heterogeneous tumours. Finally, the analysis on 22 supratentorial LGGs identified a list of 70 genes (see Additional file 6) able to dichotomize mixed glial-neuronal tumours versus PAs (Figure 4c,d). The signature consists of genes encoding adhesion, ECM-receptor interaction, matrix extracellular organization, neurogenesis, immune response, and metabolic proteins. Several genes are components of collagen gene family whose functions are associated with extracellular matrix (ECM) reorganization. Intriguingly, changes in expression of genes controlling neurogenesis (DLX1, DLX2), cell growth such as insulin-like growth factor 2 (IGF2), insulin-like growth factor binding protein 6 (IGFBP6) and latent transforming growth factor beta binding protein (LTBP2), cell motility such as l1 cell adhesion molecule (L1CAM), COL3A1 and integrin, alpha 8 (ITGA8), and interactions with the surrounding environment such as lumican (LUM), COL1A1, COL6A3 and periostin, osteoblast specific factor (POSTN) appear to be linked to the presence of neuronal cell component. Because of their rare occurrence, little is yet known about the molecular pathology of mixed glial-neuronal neoplasms and the cytogenetic and molecular genetic studies reported are very few [53–55]. Our findings show the complexity and vitality of these tumours, shedding some light on features such their richness in connective tissue and, they point to some interesting candidate genes (i.e., DLX1, DLX2) worth further investigations that could help the pathologists in the differential diagnosis. From a biological point of view, it is remarkable that the mixed glial-neuronal tumours are strikingly separated from PAs, allowing us to look differently at mixed glial-neuronal tumours in which, generally, the glial component catches the attention of the pathologists and contributes to grading. Our findings, indeed, shed some light on the biological complexity of the mixed glial-neuronal tumours, still poorly known. It remains to be established if mixed glial-neuronal tumours differ from PAs because of their ganglion-like component or because of their glial one or both. What seems indubitable is that the ganglion cell component is not a bystander. Future functional studies are needed to evaluate these targets in paediatric mixed glial-neuronal tumours versus PAs but evidence supports a role for these gene candidates in tumorigenesis. The identification of a brain region-specific gene signature suggested that LGGs at different sites may be distinct in terms of biological properties and tumorigenesis. The success of our methodology carries implications for improving the diagnosis and possibly prognosis of LGGs. The method efficiently finds and ranks genes that can distinguish one histotype from another. In addition, we performed clustering and classification of GO categories and possibly altered pathways on the basis of gene expression in infratentorial versus supratentorial LGGs, in particular in the PAs, and among supratentorial tumours, in mixed glial-neuronal tumours versus PAs. 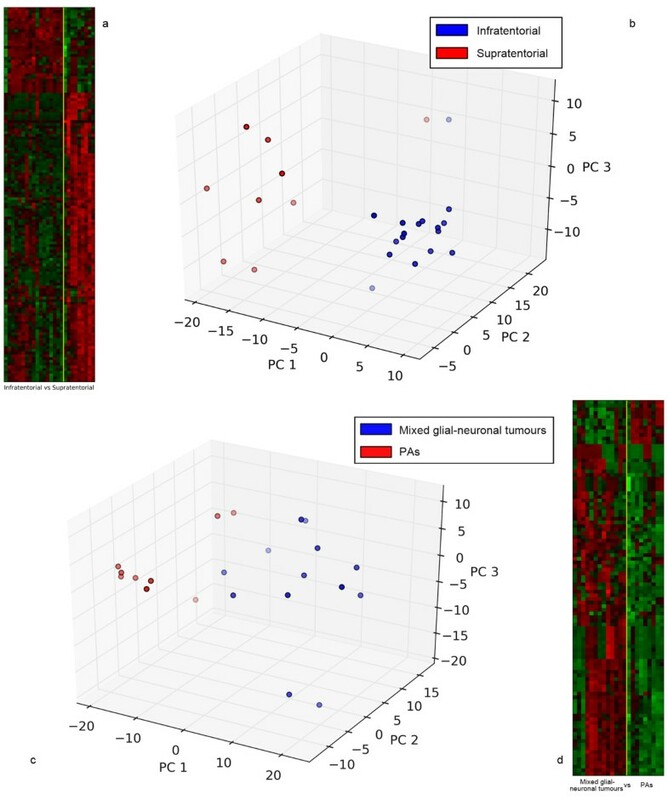 The analyses reinforce previous observations about aberrant activation of the mitogen-activated protein kinase (MAPK) pathway in LGGs but, still point to an active involvement of TGF-β signaling pathway in the PA development and, emphasize some interesting candidate genes worth further investigations for the mixed glial-neuronal tumours. Considering the high clinical and biological relevance of the disease, as these tumours are detrimental to children, and since the genetic background of paediatric glial tumours is still unsatisfied, this methodological work could mark the starting line. A genotype-phenotype correlation of LGGs is instrumental to improve classification and differential diagnosis. Impact of molecular classification will likely change how LGGs are both diagnosed and treated henceforward. This paper thus provides a novel global view of the molecular differences between infratentorial and supratentorial LGGs. Further investigation and validation by experiments should be targeted to the exploration of a deeper genotype-phenotype correlation in those LGG cases who undergo malignant transformation. Samantha Mascelli, Annalisa Barla contributed equally to this work. v-raf murine sarcoma viral oncogene homolog B1. This study was supported by the EU Integrated Project Health-e-Child IST-2004-027749, by the Associazione Italiana per la Ricerca sui Tumori Cerebrali del Bambino (http://www.artuceba.org) and by Compagnia di San Paolo (Modelli e Metodi Computazionali Innovativi per la Biologia Molecolare in Ambito Oncologico). The authors would like to thank all the patients’families. The authors would also like to thank Salvatore Masecchia for his contribution to the experimental part, Lorenzo Rosasco for many useful discussions, Valerie Perricone for the editorial assistance, and Prof. David Ellison for the useful advice. We also thank Camusso Raffaella and Tedeschi Luca (Photographic Service, Giannina Gaslini Children’s Research Hospital, Genoa, Italy) for their graphic assistance. SM and AR performed the experiments, interpreted the data and wrote the manuscript. AB performed statistical data analysis, participated in guiding some experiments and wrote the manuscript. SM, CM, DF, GW and KN participated in performing statistical data analysis. PN carried out pathological data review, contributed to the study design and with RB, provided research and editorial assistance. MH and SP provided assistance for the clinical data. GM provided neuroradiological data. AC, GP and provided tissue samples from the surgery. MLG provided tissue samples from the tissue-bank and clinical data, and with VC contributed to the study design, collaborated to the research and review the manuscript. AV contributed to the statistical analyses design and review the manuscript. All authors read and approved the final manuscript.